My Creative Map: Sketching at a café - I finally did it! Sketching at a café - I finally did it! Almost every week I have this idea of breaking up my normal daily routines by working at a café for an hour or two. In my mind I will have great coffee next to my laptop and also add some quality sketching time. But then I end up having so many excuses for not going today. This goes on week after week. But why? I have a job (freelance journalist) that makes it possible for me to work almost everywhere. And I still end up going to my office or work from home. Not on a café. I think it's because I have this idea that serious people work in offices. Working at home is already in the greyzone so I don't want to push it any further. But still I dream about cafés and I say to myself that once in a while I should really draw from the benefits of my freelancing lifestyle and just to it. So the other day I actually did! I went to a café in the center of Gothenburg in the morning. I chose a seat overlooking the entrance, had a great cappucino and sandwich and started sketching. 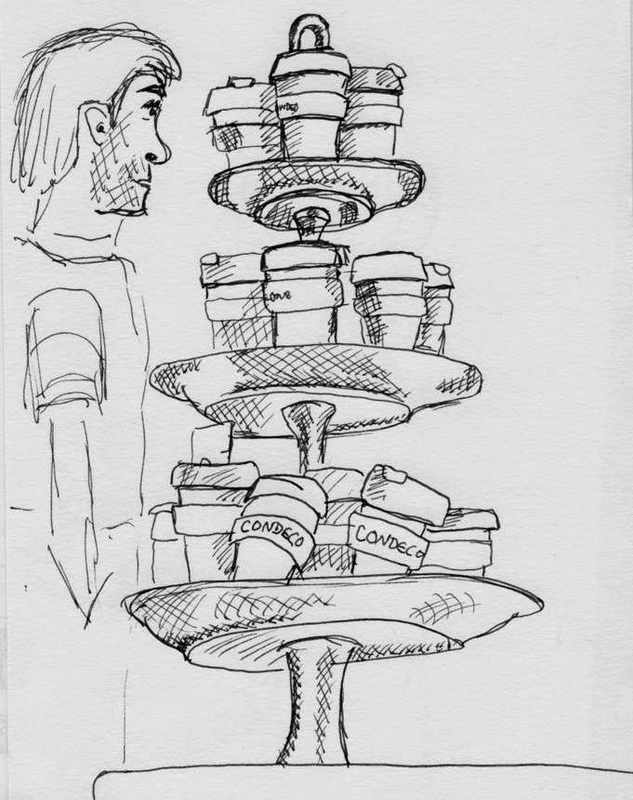 I began with this stack of take-away-cups on the counter. Great to start with since they were completelly still. And then a customer came up and stood behind them so I quickly added him. 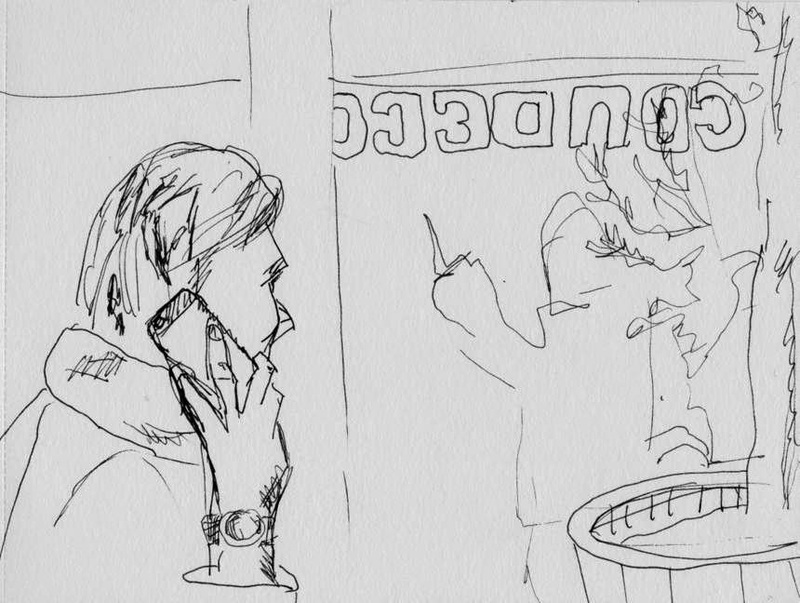 My other subjects where two customers talking on the phone. This lady actually held up with the phone for a few minutes while I captured her. 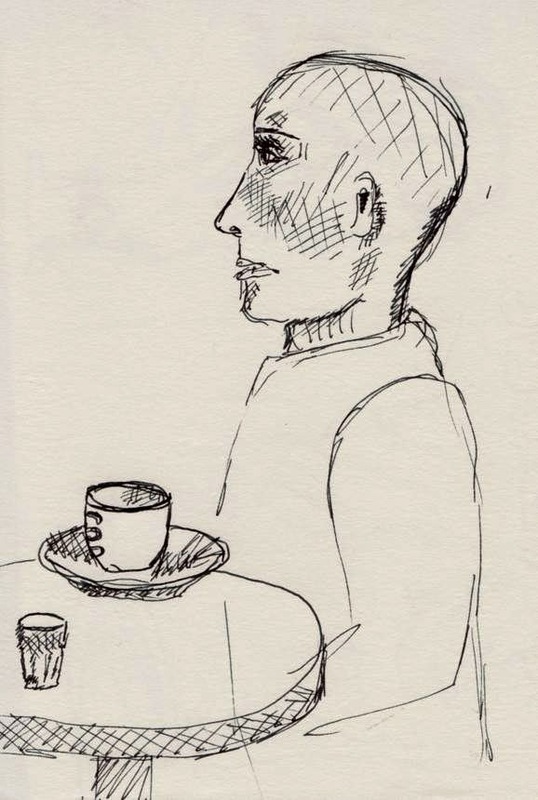 Lady without hair having a coffee. And this guy stared out of the window and talking while I did my thing. Staring out the café window. To conclude; I had a great time sketching and I actually did some work too. I must do it again.